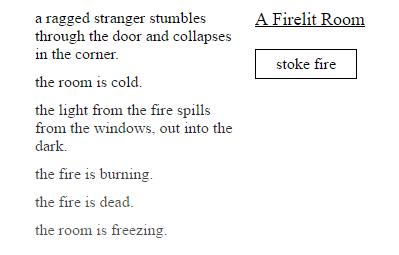 Text based games are the best of both worlds, they are low-pressure games and exciting Choose Your Own Adventure stories. They are story-telling at its most immersive. Last year Al Rosenberg recommended a few text-based games to read and play, but if you know our Games Section, you know we can’t wait to get you playing even more. Draven and Melissa sat down to suggest a few more readable delights. Fallen London is a choice-driven adventure in a gritty steampunk world. Your character levels up various abilities like persuasion, fighting, and sneakiness as you interact with other characters and choose actions that reward you with items. You encounter pub owners, assassins, crooked officials, street urchins, and many others. Unlike some choice-based games that are mostly linear and give you two or three choices at a time, Fallen London is surprisingly open-ended. At any time, you might have six or more choices available to you, and you can always back out on a quest if you don’t want to finish one. What I like most is the openness of options and how all actions, even seemingly unsuccessful ones, level up your abilities. The story writing throughout is a mix of interesting and silly—will you eradicate a rat infestation by killing them or bargaining with them to leave?—and reads like you are a Sherlock Holmes-type character who is always somewhat amused. The game’s greatest frustration is a built-in deterrent to playing it for hours nonstop: you’re allotted 20 actions, and once you use them up, they slowly replenish with one new action available every 10 minutes. If you like games that offer lots of choices yet don’t require much time commitment or any multiplayer play, give Fallen London a try. I lived my ultimate teen summer camp dream through books, and BIRDLAND brings all that imaginary time spent sharing secrets in cabins, practicing archery, and smooching fellow campers back up from the depths of my memory. In this Twine adventure, you’re Bridget, a camper who learns all the typical summer camp skills—sailing, swimming, canoeing, arts and crafts—from strange counselors and dreams of strangely literal anthropomorphic birds who seem concerned with the laws, rules, and concepts of human society. It’s every bit as weird as it sounds and at least three times as charming, the perfect mixture of oddness and humor and heart. Bridget dreams of being a pirate, a detective, a college student, and several other roles. How she acts in those roles—determined by the player, who can choose from several options throughout the game—changes her feelings the next day. How she feels determines what actions she can take, leading her down different paths on subsequent playthroughs. Like many choice-based games, BIRDLAND follows a set path with intertwining paths to explore. There isn’t a whole lot of divergence to be found but that doesn’t detract from the storytelling; it plays like a YA summer camp novel you have some degree of control over, letting you create a version of Bridget that best suits you. It’s cute. It’s fun. There’s kissing and vaguely threatening birds. There is little else to hope for in a summer camp dreamland, and BIRDLAND serves it all up with a side of delightful weirdness. In Sixth Grade Detective, you play a twelve-year-old who loves figuring out the mysteries that classmates and adults around you are involved in. Choice of Games bills it as a “109,000-word interactive young-adult novel.” Your character (you’re given options for name and gender) investigates a stolen bike, a missing notebook, school bullies, and what your classmates are up to after school. The story unfolds without graphics or sounds, and at every page, you’re given about four choices to advance. I absolutely love the writing and the characters. The writer makes you feel the stress of adolescent peer pressure: do you take pity on the awkward new student? Do you try to get on the class bully’s good side, or do you oppose her? Every choice has consequences, and you have many opportunities to choose between sneakily eavesdropping or nonchalantly confronting. You also explore a city through the eyes of a middle schooler, from a spooky auto garage to a local drugstore. If you like games or stories in the fun vein of Harriet the Spy or Encyclopedia Brown, you’ll love this game. As you keep your fire lit, the choices increase and become more complex until you find yourself head of a little village of busily working people. But A Dark Room isn’t just a simple resource management game. The world it takes place in is vague enough to leave you wondering what all those spooky details are about, like the strange teeth and cloth found in your traps. Just what is it you’re catching in there? Ah, well, just throw it on the resource pile for trading next time a stranger pays a visit. That’s not the only surprise you’ll find along the journey. Stick around long enough and you’ll see the way things begin to shift; once a benevolent overlord, you’ll soon start to see the ways that your reign changes. And unlocking the game’s other sections shows you a whole new element to A Dark Room, leading toward the game’s surprising conclusion. It’s low-tech and not all that impressive to look at, but that just gives you the opportunity to fill in the dark with horrors of your own. Trust me–open it up, get your fire burning, and let it run in the background for a while; once the story starts to take shape, you’ll see what’s so engrossing in it. Great, free games to spend your summer on! What text based games are you playing instead of working?